(Bloomberg) -- Uncertainty about interest rates, trade and oil prices could weigh on emerging economies in 2019. 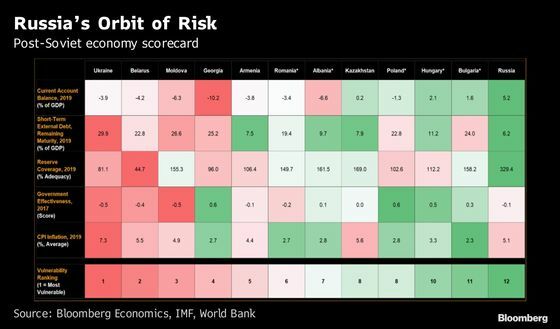 Countries of the former Soviet Union and its allies have to worry about another risk -- Russia, according to Bloomberg Economics’ new post-Soviet scorecard. While Ukraine, Belarus and Moldova are particularly vulnerable in a crisis, Russia fares well, though its slowing growth and geopolitics may cause strain in the region.